Sir John William Cradock-Hartopp, Baronet, sold Four Oaks Hall and its 246-acre park and estate to a racecourse company in 1880. The Four Oaks Racecourse Company soon laid out the racecourse with its grandstands, paddocks and stables, and the first meeting was held on March 17th and 18th 1881. It was a great success with glorious weather and crowds of 15,000 on both days. The Easter Monday meeting attracted 20,000, the half-crown stand was packed and the Grand Stand “tolerably well filled”, and there were similar numbers at the June meeting. This success was not repeated in subsequent years, and the racecourse was used for other events. One of the most ambitious of these was the hosting of the Warwickshire Agricultural Society’s annual show on Tuesady 26th July 1887. “Everything that could be done to make the show a success was done by the local committee and the inhabitants generally. They not only gave special prizes, but made the town look as attractive as possible by erecting numerous triumphal arches…on the Parade, in Mill Street, and two in High Street”. The report in the Sutton Coldfield and Erdington Times continued “On the whole the exhibition may be pronounced from an agricultural point of view a success, but financially a decided failure”. The poor attendance was thought to be due to Sutton Coldfield being “situated in an extreme corner of the county”, but the weather may have had something to do with it - “The utilization of the Grandstand for the accommodation of those who witnessed the jumping and driving competitions was a happy idea, and seemed to be highly appreciated by the visitors, especially when the rain began to fall”, while the “refreshing breeze” threatened to blow the tents away. One special attraction was the flower show, held in the spacious apartments of Four Oaks Hall. The Racecourse Company gradually declined, their accounts were in the red by 1890 and the company was wound up. Four Oaks Hall and Park were offered for sale as a “freehold residential or building estate” and soon large plots were being sold for grand houses to be built. For some time the racecourse remained undeveloped, and it saw a final spendid event in June 1898 when the Royal Agricultural Show was held there, visited by the Prince of Wales. Soon afterwards the remaining buildings, including the hall, were swept away and Wentworth Road, Ladywood Road and Luttrell Road were laid out across the site. 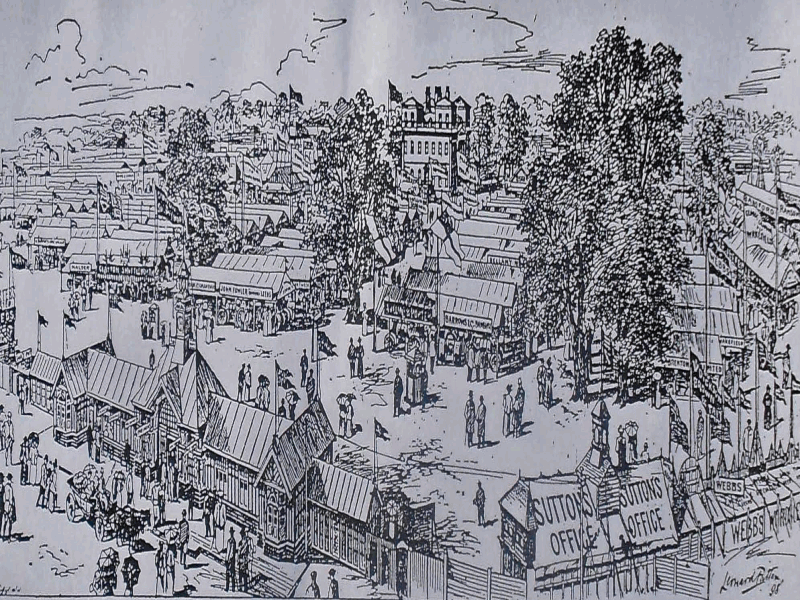 The Royal Agricultural Show, Four Oaks Park, June 1898. The road in the foreground is Bracebridge Road, the ticket office is a survival from the racecourse, the course itself surrounds the vast array of exhibitor’s stands, with Four Oaks Hall in the centre. 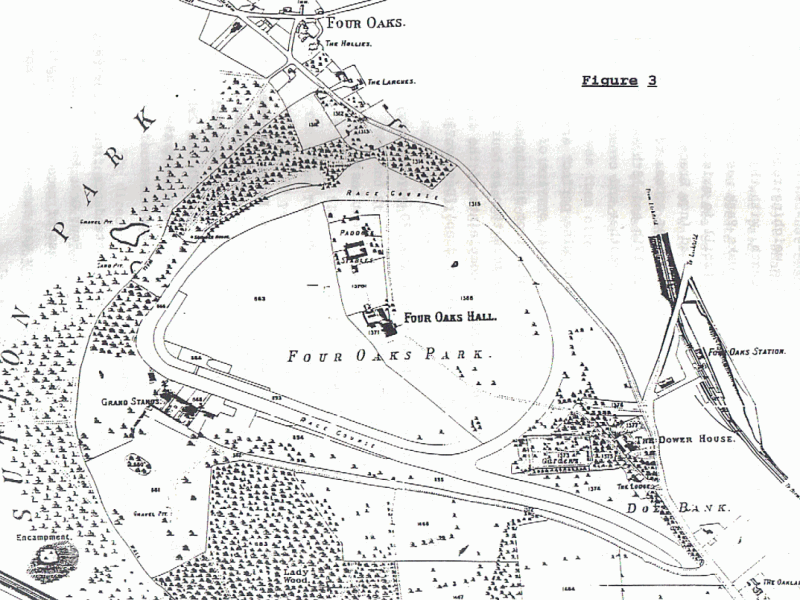 Plan of Four Oaks Park from the 1890 sale particulars. The grandstands are on the site of the Four Oaks Tennis Club, and the road leading up to the grandstands, now Bracebridge Road, was laid out by the Racecourse company in 1880, four years before the Lichfield Extension Railway, with its station at Four Oaks, was completed.